For Reflectors Up to 60"
The Impact Telescopic Collapsible Reflector Holder is ideal for mounting reflectors such as Impact, Flexfill, or Photoflex light discs up to 60" to a light stand. It mounts to any stand that has a 5/8" diameter top stud. It includes a 5/8" female stand adapter with female 3/8" and 1/4"-20 threads for stands topped with those threads. Alternately, it can hold a small light head to an extension of almost 3' from the center of your light stand (with the addition of a 3/8" to 5/8" adapter, not included). Two-section support arm telescopes for use with different size reflectors. Box Dimensions (LxWxH) 30.0 x 5.5 x 4.5"
Telescopic Collapsible Reflector Holder is rated 4.5 out of 5 by 215. Rated 4 out of 5 by MIKALI from Excellent backup assistant! As most of you know, you don't always have an assistant available on those last minute shoots. That is where this nifty accessory comes in. I have mine connected to a Photoflex LSB-2214 8' medium light stand. It takes just a few minutes to set up the arms and clamps where you need them. You will find that fine adjustments can be a little tasking but if that is the extent of your problems then you are in good shape. I have the 32 Multidisc 5 in 1 that I prefer and it works great with the above setup. The combination between the stand and holder does give the shooter many options and directons in which to place ones reflectors/diffusers. Rated 5 out of 5 by Lincoln H. from Handy dandy. I really like this reflector holder. It is much sturdier than I thought it would be based on the previous reviews. I like that I can slide the clamps and use it to hold small or big reflectors and the clamps have a nice sturdy feel to them. I used this to hold a reflector (medium size) in the middle of a pretty windy shoot and it worked perfectly. It's one of those things that when you don't have it you miss it but when you have it and it is working properly you don't even think about it. Good tool - it's not the same as having a person holding it for you and able to follow your model but it's about as close as you can get. Rated 5 out of 5 by John from Very Flexible and Stable ... With a Strong Stand There are other comments on this attachment which seem to indicate it's not as stable as needed, but I've found, at least with a 46 reflector, it's just as stable AS THE JOINT HOLDING IT. In other words, make sure the connector and stand are non-slip and heavy enough to handle the off-balance weight this provides. As for this holder itself, the counterweight is a brilliant feature that most other holder units lack. I am able to position a large-ish reflector at high and low angles, even with the reflecting surface facing upward, without slippage. A 22 reflector is relatively no load at all. This unit certainly takes the pain out of holding the reflector yourself or trying to talk your significant other into it ... again. Some experience and patience with adjusting multiple joints simultaneously is required. Rated 5 out of 5 by Daryl A. from Convenient as a boom or reflector holder This can be used to hold small lights up and out of the way, or you can clamp your collapsible reflector or scrim to it for modifying lights. I use this to hold my hair light and to hold my 42 collapsible reflector with just the white shoot-through. It can hold a lot of weight if you attach a sand bag as a counterweight. It also has an included counterweight that is heavy enough for holding your scrim or a very small on-camera LED. Folds down shorter than the other Impact boom arm (the silver one with no clamps built in) so it can fit in standard 35 bags with room to spare. Rated 3 out of 5 by Andrew G. from Works, but wish the clips were stronger I purchased both this holder as well as the Avenger Reflector holder that's the same size. The Impact has the advantage of having a removable counterweight and better clip system. However, the metal part of the clips that attaches to the handles is pretty thin and I worry about it bending. Also, I wish the clips were wider and not so scrunched up against the shaft. If I had to pick between the Avenger and Impact Reflector holder, I'd pick the Impact, but I intend to keep both. It is so nice having these, though. No more propping reflectors up and having them fall down, or having to have an assistant hold a reflector for an entire session. Rated 5 out of 5 by RubCol from Firm and secure! Useful and versatile tool. Besides holding the reflector with the pliers, I used to improvise funds portrait shots, or even as an arm with universal support for flash, and base materials are of great ste.Los quality and finish of the tool are excellent. The pair of tweezers with which has firmly hold the reflector (tested with one big circle!). They also have a clamp that prevents damage to rubber materials presionan.________________________________________Useful and versatile tool. In Addition to attach the reflector With The clips, i used to improvise backgrounds in portrait shots, or even as arm: with an universal shoe mount adapter and speed light stand.Materials are of great quality, and the tool finishes are excellent. The pair of pliers That has Firmly fastens the reflector (Tested with one large circular!). They have a rubber That Prevents damage to attached materials. Rated 2 out of 5 by Tim from Not that great Although this is advertised as a reflector holder, it also claims to hold a small light head to an extension of 3'. I have trouble getting it to hold my sb-600 without bending. It works fine with the right counterweight but still flimsy. Works fine for light reflectors. Rated 1 out of 5 by Alex from Only for use with 12 reflectors Broke the minute I attached my 48 reflector. Really cheap quality, I don't think it could support the weight of anything larger than a 12 reflector. What accessory do I need so I can use the tip of it for mounting light or microphone ? I own one and it's not threaded, so I can't put anything right now. Thank you. How do you assemble this? Is there a YouTube video? No assembly required. Unbox it, remove plastic, mount on stand and adjust to the size of your reflector. Can the weight at the end be removed so the arm can be centered over the stand? Yes, the weight is able to be taken off by simply unscrewing it. 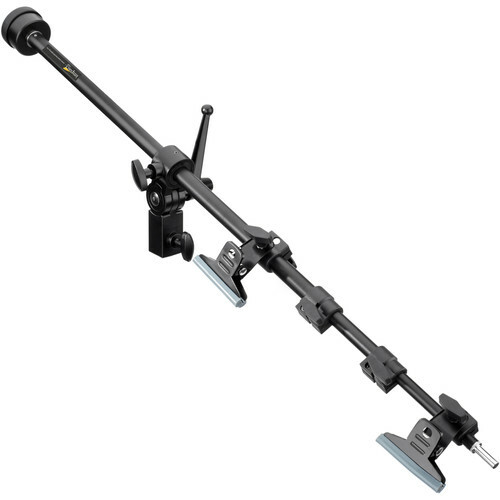 Can the light stand mount be positioned between the two clips or do the clips both have to be on the same side of the light stand mount? I'm thinking about possible options for holding a 5x7' collapsible background. Thank you. I don't have any problems with it. But moving a clip to the counter balance side would require a major modification to it. Not easily done at all. I just need the clips. Anyone know where can I find/buy them? (not available at b&amp;h) Thanks. Unscrew so easily... I don't know were to buy new one, but I took another clip that I have and drill a hole in it. Can anyone recommend the best light stand for this? Do I need a heavy duty one or can I use any light stand? This is not that heavy, but too light a light stand might blow over if you are outside &amp; it's windy. Inside just about any light stand will work fine. Can the Impact Telescopic Collapsible Reflector Holder be easily mounted to a standard C Stand? Hello; I just received this product today and have a question about how to attach a speed light style flash. The package include a small brass internally threaded adapter of some sort, but I'm not sure how to attach it nor can I find any instructions. Can you explain what I need to do?Thank you. I think/hope I have the solution. I ordered an adapter directly from Manfrotto which I think was made to convert a 3/8&quot; stud, which is what the tip of this arm is, to a 5/8&quot; stud and 3/8&quot; threaded male combo. When it arrives, I'll be able to ascertain if I solved this problem. The adapter I found seems to be the only well-fitting solution. We'll see. I do disagree with others who think the arm won't support the weight of a flash.